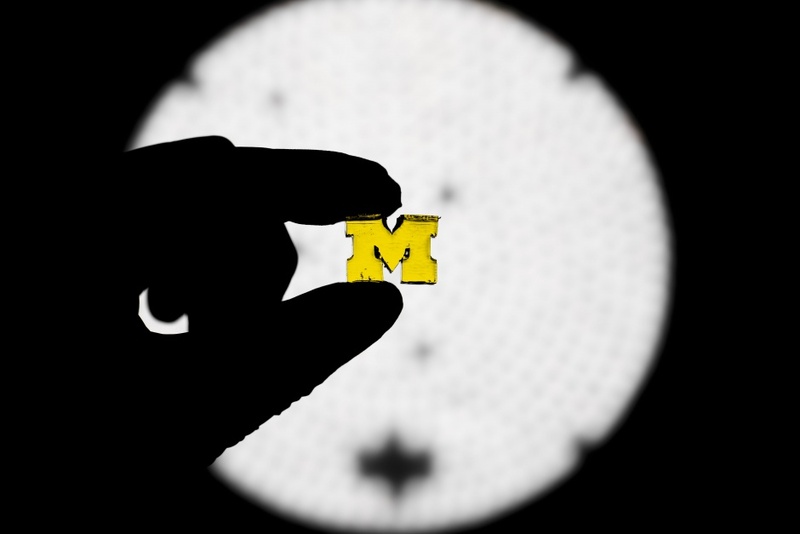 A new 3D printing technique that uses light to produce complex shapes from a vat of liquid resin is up to 100 times faster than conventional 3D printing processes, claim its developers at the University of Michigan. The method – which uses two lights to control where a curable liquid resin hardens and solidifies and where it stays fluid – has so far been used to print a variety of complex three dimensional demonstration shapes including a lattice, a toy boat and a block letter M.
The group claims that the technique overcomes the limitations of earlier so-called vat-printing efforts, which encountered problems with the resin solidifying on the window that the light shines through, stopping the print job just as it gets started. One earlier solution to this problem was a window that lets oxygen through, which penetrates into the resin and halts the solidification near the window, leaving a film of fluid that will allow the newly printed surface to be pulled away. But because this gap is only about as thick as a piece of transparent tape, the resin must be very runny to flow fast enough into the tiny gap between the newly solidified object and the window as the part is pulled up. This has limited vat printing to small, customised products that will be treated relatively gently, such as dental devices and shoe insoles. By replacing the oxygen with a second light to halt solidification, the Michigan team can produce a much larger gap between the object and the window – millimeters thick – allowing resin to flow in thousands of times faster. The group claims that these innovations mean that the process can be used to produce far more durable components than those made with existing 3D printing techniques. “You can get much tougher, much more wear-resistant materials,” said Timothy Scott, U-M associate professor of chemical engineering who co-led the development of the technique. U-M has filed three patent applications to protect the multiple, inventive aspects of the approach and Scott is preparing to launch a startup company. A paper describing this research is published in Science Advances.